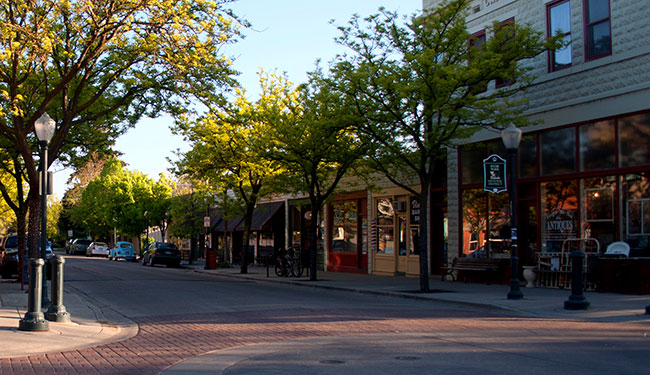 The North End of Boise is known for its charming houses and tree-lined streets. But what gives the area so much character are some of the houses that can be dated back to the late 1800s. Along with the historic architecture in homes, the area even features its own little downtown. That little downtown is known as Hyde Park and is located on 13th Street in the heart of the North End. Hyde Park has several restaurants, bars, and even some little mom and pop shops. This neighborhood won’t leave you without something to do. Once you’ve adventured around Hyde Park, you’ve gotta check out Camel's Back Park located at the end of 13th Street. The park has a playground, tennis courts, a volleyball court, outdoor gym, and a trailhead to a scenic view of the city. While on your way to Bogus Basin, you will travel on Harrison Blvd. One of the most epic streets in Idaho, and possible the United States, Harrison Blvd and it's charm is an iconic symbol Boise. Lined with big, beautiful maple trees during it's 3.5 mile stretch, multiple large classic 1940's aged homes and their unique style lie beyond the row of maples, extending for blocks to the east and west. This place is a must see and a very desirable place to live. Only a couple blocks from downtown you can ride or walk your bike to just about anywhere you need to go, making it a very convenient location for most Boiseans. Also known as the historic district, you can feel that this neighborhood is somewhat of an extension of the North End. And something many don’t know about the area is why exactly it’s called “Warm Springs,” as well as the East End. The name comes from the fact that the area sits on a centralized system of geothermal heat, and helps power some of the city through geothermal energy. This grown in and homey-neighborhood features some of the oldest and largest houses in Boise. Residents are just down the street from downtown, and footsteps away from some of the Boise Foothill trails. Located within the area is the Kristin Armstrong Municipal Park, which is a great place to bring the family and have yourself a picnic. Another feature of this neighborhood is the Old Idaho Penitentiary Site, located at the base of Table Rock you can take a tour of the historic site and see what it was like way back when. The type of neighborhood, where you can walk next door and borrow what you need for that dinner you’re making. Even further East, you can find Harris Ranch. 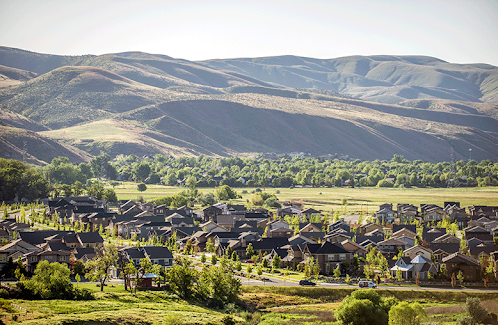 The city of Boise is expanding, and new areas like Harris Ranch are developing. This area incorporates the feel of outdoor charm with having the urban aspect just being minutes away. Integrated within this beautiful neighborhood you can find the Boise River, trails within the foothills, and parks. And when you’re out on your nightly stroll, don’t be surprised when you see some local wildlife. This suburban area of Boise isn’t far from downtown and is located in close proximity to Boise State University. New and old homes fill the large land area, while also encompassing the Greenbelt (a 25+ mile path connecting Lucky Peak Dam to the City of Eagle), part of the Boise River, and multiple parks. Some of the iconic parks include Anne Morrison Park and Julia Davis Park. With plenty to do, South East Boise isn’t a bad spot to find yourself. Bown Crossing is it’s very own little community. Located close to the Greenbelt and Park Center, you have access to a little bit of everything. The area is up to date and is continuing to see growth in both population and businesses. While you can expect to see new developments, there are also plenty of unique properties. A shopping center and some of the more popular restaurants in Boise are nearby. The area has its own lifestyle, and sense of energy while still being relatively close to downtown and other parts of Boise. Why is it called “The Bench”? Partly due to the fact that it sits approximately 60 feet higher than downtown Boise and to the northeast, and others in part due to the fact that the bench is its own little suburban community. Many businesses on the bench, brand themselves that way because it is such a big area, that you don’t have to go far to get what you need. Plus with a mix of new and old neighborhoods, you get an area that really has it all. The bench is its own cool, little community that is continuing to expand. The area that encompasses West Boise borders the City of Meridian. This part of town is considered to be well established and have many residential developments. Along with the old and new developments, the area offers great shopping and restaurants. The Boise Towne Square Mall is a major feature and is also the largest mall in the state. The overall suburban feel is what makes this part of Boise one of everyone’s favorites. West Boise has a little bit of everything you need. This part of Boise runs along the base of the foothills towards the city of Eagle. Close to the North End and not far from the heart of downtown, you are able to access all the best parts of Boise with already being located next to the foothills. Living next to the foothills, you have access to amazing trails and outdoor recreation options. Homes in this part of Boise are typically a little older but have quaint character. There are also pockets of newer homes in sections of this neighborhood. 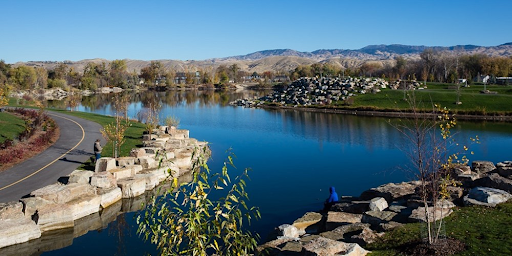 Northwest Boise is well established, and just a hop, skip, and step from Downtown. Located 10-15 minutes from downtown Boise, the area of South Boise has continued to expand and evolve with the rest of the city. Any area between Boise State University, the airport, and Federal Way can be considered South Boise. The neighborhoods vary from homes that were built in the 1960s to new and updated ones. But what makes the older neighborhoods so unique is the amount of land that some of them include. Within some of the subdivisions are acre-sized plots and farms. At one point there were efforts to keep the area from growing, but since the area has continued to develop into a popular part of Boise. We recognize that Garden City is it’s own and separate municipal government, but because of the close proximity to Boise, the areas share a unique relationship. With Boise continuing to grow at a rapid pace, Garden City is starting to receive some overflow and grow itself. The population is estimated to be about 12,000, but still has potential and opportunity for even more residents. The city runs along the Greenbelt, and uses the feature to it’s advantage. You can find some of the best restaurants, breweries, and coffee shops with outdoor seating. Take our word for it, Garden City is happening.